Matt Hinton discusses the way to rebuild an offensive line, which Michigan has needed for, oh, the last three years (LINK). Hit the jump for some Emma Glover. Last year: O'Korn played for Houston. He completed 90/173 passes (52%) for 951 yards, 6 touchdowns, and 8 interceptions. You can find a commitment post for O'Korn here (LINK). Harbaugh and O'Korn showed some immediate mutual interest after Harbaugh was hired and O'Korn, who was displaced as the Cougars' starter, decided to transfer. As a non-graduate transfer without any kind of immediate waiver, O'Korn will have to sit out the 2015 season due to NCAA rules. Since he did not redshirt at Houston, this will count as his redshirt year and he will be eligible for the 2016 and 2017 seasons. Naturally, a player guaranteed to redshirt is not particularly important to this squad except perhaps as a talented scout team player. He should compete for the starting job beyond this season. It's that time of year. The 2015 season countdown will begin here very shortly, and this is my annual explanation and disclaimer. The countdown will consist of at least one daily profile of a player on the team, from least important to most important for the 2015 season. This is not a rundown from worst to best, or from least favorite to most favorite. The #1 player on the list will be the least expendable guy. For example, Jake Ryan might very well have been Michigan's best player last season, but the presence of other talented, experienced linebackers (Desmond Morgan, Joe Bolden, James Ross, Ben Gedeon, etc.) allowed me to put him at #6 in the 2014 season countdown. On the flip side, Devin Gardner had some clear weaknesses, but the dropoff from Gardner to backup Shane Morris was evident on a team lacking playmakers, so Gardner was ranked #1. For the complete 2014 countdown list, you can go here (LINK). So from here until September 3, you can expect roughly one player profile per day. Happy countdowning! NOTE: All players who have not yet been announced as departing will be accounted for in the countdown, and any unannounced incoming transfers will have to be shoehorned in at a later date. So far defensive end Brennen Beyer is trying to stick with the team as an outside linebacker (LINK). If you would also like to donate to the site redesign drive, please use Paypal (on the left sidebar) or do some shopping on Amazon (LINK). The new site is tentatively scheduled to launch on June 7. Thanks! Ben Bredeson - OT - Hartland (WI) Arrowhead: Bredeson is a 6'5", 293 lb. prospect who has offers from Michigan, Notre Dame, and Wisconsin - the group that appears to be his top three - as well as numerous others. He's a 247 Composite 5-star, the #4 offensive tackle, and #26 overall. Bredeson's brother, Jack, is committed to Michigan to play baseball, and Ben has visited Ann Arbor multiple times. Wisconsin leads the Crystal Ball picks with 79%, and Michigan is second with 17%. A decision is expected in the next several weeks. Kiante Enis - S - Winchester (IN) Community: Enis is a 6'1", 200 lb. prospect with offers from Cincinnati, Indiana, Michigan, and Michigan State, among others. He's a 247 Composite 3-star, the #52 running back, and #710 overall. Enis carried the ball 299 times for 3,189 yards and 49 touchdowns as a junior in 2014. Michigan is recruiting him as an athlete, and he could play running back, wide receiver, or safety at the next level. This will be his first visit to Michigan. Chris Evans - RB - Indianapolis (IN) Ben Davis: Evans is a 5'11", 186 lb. prospect with offers from Illinois, Indiana, Minnesota, and Purdue, among others. He's a 247 Composite 4-star, the #6 all-purpose back, and #293 overall. As a junior in 2014, he had 185 carries for 1,249 yards and 18 touchdowns, plus 51 catches for 676 yards and 10 touchdowns. With no offer from the Wolverines, it's unclear whether the coaching staff wants another running backs, wants to keep tabs on Evans as a backup plan, or might want him to play another position. Somewhat like Enis, Evans could play wideout or safety at the next level. Hit the jump for a couple more 2016 visitors and a 2017 prospect. Thanks to those of you who have been reading the site over the years. Here's an extra dose of beautiful women to help us celebrate! The weekend has begun, so enjoy some pictures of beautiful women, including a runway model gif. Here's Bill Connelly's in-depth preview of Michigan's upcoming season (LINK). James Light breaks down the outside zone run play (LINK). Projection: Defensive end. Depending on how his body develops, Johnson could play either the weakside end or strongside end position. He does not have the speed and suddenness to be a complete terror as a pass rusher, but he has enough speed to be a consistent threat and enough tenacity to finish plays with hustle. Johnson is a high-floor player who, at the very least, should be able to hold his own against the run and make some Brennen Beyer- or Craig Roh-like plays on the quarterback. There are times in his film where he crushes lead blockers, and he has a violent way about his play that makes me think he likes punishing anyone with an opposing jersey. Reminds me of: Frank Clark. I mentioned Beyer and Roh up above as kind of Johnson's floor, but when Clark was clicking, he was very tough to deal with. Johnson is probably a little taller and his game is more developed at this point, but both guys have good frames, a good wingspan, and a nasty attitude. Likelihood of committing to Michigan: Johnson recently named a top fifteen that included Michigan, and the Wolverines have even been reported to be in his top two schools (along with South Carolina). Johnson visited Michigan this spring with teammate Brad Hawkins, who also holds a Michigan offer. The Wolverines have as good of a shot as anyone. Here are fifteen names of guys transferring, several of whom were big-time recruits (LINK). Blake Countess makes an appearance. It has been known for a while that running back Justice Hayes would transfer, although the destination was unknown; he's now planning to play for Southern Miss. Blake Countess somewhat abruptly announced a transfer not long ago, and yesterday he told the world that he would be ending up at Auburn. Countess is headed to Auburn, which has a depleted secondary that might become even more depleted in the coming weeks. Jonathon Mincy graduated and got a tryout with the Atlanta Falcons. Jonathan Jones, meanwhile, made 6 picks last season and despite suffering a minor injury this spring, he will be one of the Tigers' starting corners this fall. On the other side, Joshua Holsey is a senior who started seven games last fall, making 41 tackles and 2 pass breakups. He will probably be Countess's primary competition to start, since no other returning players saw much action. Otherwise, Auburn is bringing in several freshmen to compete, including 4-stars Carlton Davis and Javarius Davis. If Countess transferred for playing time reasons (which is partially rumored to be the case, since the coaching staff pursued Wayne Lyons), he's going to have to compete against Holsey and some other talented athletes in the SEC. In Hayes's case, Southern Mississippi returns its top four running backs from last year. None of them was very accomplished, though. The leading back was then freshman Ito Smith (536 yards, 3.9 yards/carry, 2 touchdowns), while little used freshman Tez Parks and junior Jalen Richard averaged 5.6 and 5.9 yards/carry, respectively. Hayes enters a rather crowded backfield, but Conference USA is weaker competition, and Southern Miss typically survives with 3-star and 2-star recruits. Hayes has decent speed, and while his production was never anything special at Michigan, he should be able to get some playing time in that backfield. He also offers the flexibility to be able to move out into the slot and catch some passes, and he could help on kickoff returns, although the Golden Eagles return senior Michael Thomas, who averaged over 24 yards/return and took one to the house last year. Neither player is walking into a situation where he will be guaranteed a starting gig, and he won't necessarily be the most talented guy at his position, either. In recent years we have seen players like Josh Furman, Thomas Rawls, and Richard Ash leave Michigan only to flourish elsewhere immediately. It will be interesting to see whether Hayes and Countess continue that trend. Personally, I have always been high on Countess and I think he's better than Holsey - but I also think he's better than Wayne Lyons. Meanwhile, Hayes was uninspiring during his time at Michigan and struggles to run through contact, but he should bring a little speed to the Southern Miss backfield and get a fair chance to shine. Former Michigan cornerback Blake Countess is transferring to Auburn (LINK), and former running back Justice Hayes is heading to Southern Miss (LINK). Both are fifth year players who have already graduated from U of M.
Hit the jump for a few good looking women and an enticing gif. NOTE: I posted a short recruiting update on 2018 prospects yesterday (LINK). New Orleans (LA) Brother Martin tight end Peyton Aucoin was offered by Michigan. He's a 6'4", 255 lb. prospect who has lots of a lower level offers, along with Arizona State, North Carolina State, and Texas. He's a 247 Composite 3-star, the #44 tight end, and #1015 overall. Aucoin is not known for his pass catching skills, but he blocks very well and has the size to be an in-line tight end and essentially another lineman. Plantation (FL) American Heritage defensive end Brian Burns was offered by Michigan. He's a 6'5", 212 lb. prospect with offers from Alabama, Auburn, Clemson, Florida, Florida State, Georgia, LSU, Miami, and South Carolina, among others. He's a 247 Composite 3-star, the #27 weakside end, and #438 overall. As a junior in 2014, he had 75 tackles, 17.5 tackles for loss, and 12 sacks. He claims a 4.76 forty and was invited to The Opening. Burns is a long, lean, quick-twitch guy who has the makings of an impressive pass rusher. You may want to watch his highlights for some pretty impressive basketball highlights that are interspersed throughout. Abbotsford (BC) Abbotsford wide receiver Chase Claypool was offered by Michigan. He's a 6'5", 205 lb. prospect with offers from Arizona, Mississippi State, Nebraska, Oregon, Utah, and Washington, among others. He's a 247 Composite 3-star, the #168 wide receiver, and #1159 overall. The talent, coaching, and passion for football just isn't the same in Canada as it is in the United States, so Canadian prospects are tough to judge based on their level of competition and their lack of precise coaching. However, Claypool has some good change-of-direction skills for being so tall, and he looks like a basketball player when going up for the ball. British Columbia - the southwestern province of Canada - borders the state of Washington, and Oregon appears to be the front-runner for Claypool's services. Hit the jump for several more 2016 offers, a few 2017 offers, some guys who committed elsewhere, and some random bits. Jim Harbaugh has been searching high and low for good quarterback play (LINK). Hopefully he's found it in one of the guys coming in. It's Memorial Day, so hit the jump for some women in red, white, and blue, including an Ashley Sky gif. 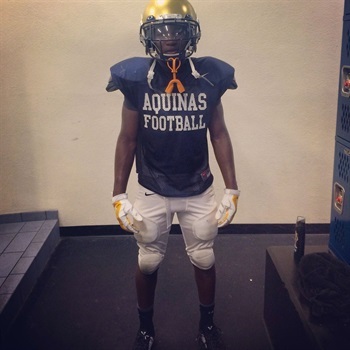 Fort Lauderdale (FL) St. Thomas Aquinas cornerback Asante Samuel, Jr. NOTE: I apologize for the light posting over the past few days. We are in the middle of spring practice, and I have had various family obligations over the past several days. Here are some bits on the 2018 class since it's a holiday, and some larger updates on the 2016 and 2017 classes will be coming tomorrow. Fort Lauderdale (FL) St. Thomas Aquinas cornerback Asante Samuel, Jr. was offered by Michigan. He's a 5'10", 165 lb. prospect with offers from Alabama, Clemson, Florida State, Miami, and Ohio State, among others. He claims a 4.66 forty. His father is Asante Samuel, the former fourth round NFL Draft pick out of Central Florida. He was chosen by the Patriots in 2003, made 63 total interceptions (including 10 for New England in 2006) for the Patriots, Eagles, and Falcons, and last played in 2013. He played in four Pro Bowls at cornerback. Fort Lauderdale (FL) St. Thomas Aquinas cornerback Benjamin Sapp III was offered by Michigan. He's a 5'10", 160 lb. prospect with offers from Alabama, Clemson, Florida State, Miami, and Ohio State, among others. Sapp is the son of former NFL cornerback Benny Sapp, who was undrafted out of Northern Iowa in 2004 (he originally attended Iowa but was kicked off the team after legal troubles). He made the Kansas City Chiefs out of camp, and he would end up making 240 tackles and 6 interceptions for the Chiefs, Vikings, and Dolphins from 2004-2011. Sapp and Asante Samuel, Sr. were high school teammates. Plantation (FL) American Heritage cornerback Patrick Surtain, Jr. was offered by Michigan. He's a 6'0", 180 lb. prospect with offers from Alabama, Clemson, LSU, Miami, and Tennessee, among others. He is the son of Patrick Surtain, who attended New Orleans (LA) Edna Karr - the home of Munchie Legaux - before playing football at Southern Miss. He became a second round NFL Draft pick by the Miami Dolphins in 1998, making the Pro Bowl three times at cornerback and making 37 career interceptions. He retired in 2008 after a four-year stint with the Chiefs. Moore (OK) Southmoore offensive tackle Brey Walker was offered by Michigan. He's a 6'5", 295 lb. prospect with offers from Oklahoma, Oklahoma State, and SMU. He was named a First Team Freshman All-American by Maxpreps. As far as I can tell, Walker does not have a famous father, but he did win a state championship in wrestling as a freshman. Labels: 2018 recruiting, Asante Samuel Jr., Benjamin Sapp III, Brey Walker, Patrick Surtain Jr.
Jim Harbaugh has taken some heat for satellite camps, which should be made illegal if they're so damaging (LINK). Hit the jump for a few good looking brunettes. Celebrate the weekend with some good looking women. 2015 Team Ranking: #22. Michigan State signed five 4-stars and sixteen 3-stars. Cream of 2015 Crop: Far and away, Michigan State's top signee was Hubbard (OH) Hubbard running back Larry Scott (see below). The 6'2", 228 lb. bruiser was a 4-star, the #6 running back, and #59 overall. I was also high on Detroit (MI) King offensive guard/defensive tackle Kyonta Stallworth, the #9 offensive guard and #185 overall player in the class. 2016 Team Ranking: #9. With a recent flurry of commitments, Michigan State has two 4-stars and ten 3-stars verbally pledged. This ranking may jump a little bit in early June, when two highly touted defensive ends (Indiana's Auston Robertson and Illinois' Josh King) plan to announce their decisions. Cream of 2016 Crop: The Spartans' top two commits are both wide receivers. Cleveland (OH) Benedictine's Justin Layne is #149 overall, and Sicklerville (NJ) Timber Creek's Cameron Chambers is #183. Michigan State also earned a pledge from former Michigan verbal commit Messiah DeWeaver from Huber Heights (OH) Wayne. All five of the 2016 players mentioned here held Michigan offers. 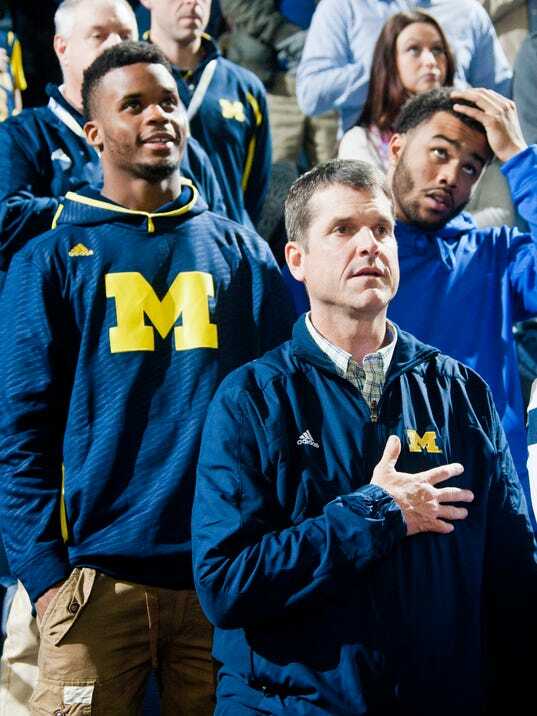 I'm not a big fan of Michael Rosenberg, but here's his SI piece on Jim Harbaugh (LINK). I am a fan of the pictures below. NOTE: I'm bumping this from a couple days ago since it was posted late in the day. I originally posted a projected depth chart back in December of 2014 (LINK), but obviously, things have changed since then. Things will continue to change over the summer, as players transfer in, transfer out, quit, play their way up the list, or get injured. There are a couple projected transfers I'll include on the list for the time being. I am not including Ondre Pipkins, who will likely go on medical scholarship. Keep in mind that some positions might fluctuate depending on what defensive package is in the game, the other team's strengths, game situation, etc. Unbeknownst to Ramzy Nasrallah, he gives a shout-out to TTB (via MGoBlog) for a post about Joey Bosa from three years ago (LINK). The article talks about why Ohio State fans love certain guys that they would absolutely hate if they played for Michigan, and that point cuts both ways. Yeah, that's right. Michigan. What is up with Michigan's recruiting? 2015 Team Ranking: #38. Michigan signed six 4-stars and eight 3-stars in February. The 14 total signees is Michigan's smallest class in the Rivals era, which began in 2002. Cream of 2015 Crop: The biggest fish is Saginaw (MI) Heritage wide receiver Brian Cole, who was a 4-star, the #5 athlete, and #74 overall. 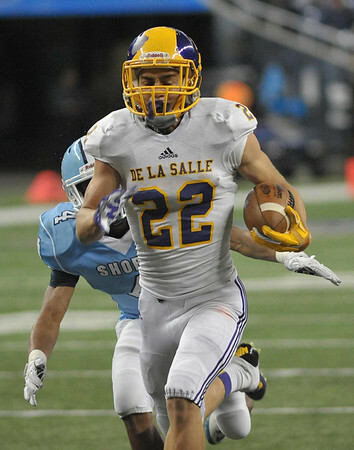 Cole was a speedy jack of all trades in high school, playing running back, receiver, safety, returner, and punter. He enrolled early in the spring and got positive reviews, although he needs to get stronger in order to match up against college players. The Wolverines also pulled in a late steal in the form of Albuquerque (NM) Eldorado quarterback Zach Gentry, a 6'7", 230 lb. pro-style quarterback who's a 4-star, the #8 player at his position, and #175 overall. 2016 Team Ranking: #31. Michigan has three 4-stars and three 3-stars committed. Cream of 2016 Crop: Michigan's highest rated recruit so far is Downers Grove (IL) South offensive tackle Erik Swenson, who committed to Michigan in November 2013 and has since pulled in an offer from Alabama. He's a 4-star, the #17 offensive tackle, and #158 overall. Slightly behind him is Avon (IN) Avon quarterback Brandon Peters, who chose Michigan over LSU in early April 2014. Peters is a 4-star, the #9 pro-style guy, and #185 overall. Fifth year grad transfer Blake Countess took an official visit to Arizona, where the coach he committed to at Michigan (Rich Rodriguez) is now the head man (LINK). I like the second picture below the jump. 2015 Team Ranking: #48. The Terps signed two 4-stars, fifteen 3-stars, and one 2-star. Cream of 2015 Crop: The Terrapins stole Gaithersburg (MD) Quince Orchard defensive tackle Adam McLean from Penn State after he decommitted in November of 2014. McLean is a 6'2", 290 lb. prospect who's a 247 Composite 4-star, the #14 defensive tackle, and #124 overall, and you can see his highlights below. The only other 4-star is Washington (DC) Friendship Collegiate interior offensive lineman Quarvez Boulware, the #256 overall player in the 2016 class. 2016 Team Ranking: #21. The Terps have two 4-stars, five 3-stars, and two 2-stars. Cream of 2016 Crop: Potomac (MD) Bullis quarterback Dwayne Haskins had offers from all over the country, including Michigan, before pulling the trigger for the Terrapins last week. Auburn, Clemson, Florida, Florida State, LSU, Ohio State, and Texas, among others, were all after the 247 Composite 4-star, #5 pro-style quarterback, and #61 overall player. I had Haskins as the #4 quarterback on my wish list for Michigan (LINK). Meanwhile, Olney (MD) Good Counsel linebacker Keandre Jones doesn't have the same caliber of offers, but he's the #11 outside linebacker and #146 overall. This is the story of how Michigan got Gwendolyn Bush (and Wayne Lyons) to come to Michigan (LINK). Hit the jump for four beautiful ladies. Over the last couple weeks, news has come out about Michigan's recruiting staff. Most significantly, director of player personnel Chris Singletary is out. The former Michigan linebacker reportedly created a bit of a rift in recruiting circles around the state of Michigan. The story goes that he only had strong relationships with a few schools - the ones that would have perennial FBS prospects - and largely ignored a lot of the other coaching staffs in the state, except when they would have a blue-chip prospect. Now that he's gone, some of those traditionally talent-laden schools are miffed. There are rumors floating about that Singletary burned some bridges to Michigan on the way out, too. Contrary to that rumor, Scout's Sam Webb says that Singletary is being considered for an administrative job within the athletic department, which would be an odd move for a guy who allegedly bad-mouthed the program toward the end. Webb is typically a trusted source, but he is also friendly with Singletary, so the truth might lie somewhere in the middle. Meanwhile, former Paramus (NJ) Catholic head coach Chris Partridge, who was hired a few months ago, is now the lead man in the recruiting office. He and Matt Doherty are handling the majority of recruiting info, but Jim Harbaugh has also pulled out the ace he had up his sleeve: Erik Campbell. Campbell, who played and coached at Michigan, spent time with Iowa and the Montreal Alouettes in recent years. He was hired to work in the football program this offseason, and now it looks like he will have the task of maintaining and/or mending relationships in the state. Campbell, who grew up in Indiana, was an associate head coach under Lloyd Carr and has a very good reputation. I expect Campbell to return to coaching before too long (whether on Michigan's staff or elsewhere), but in the meantime, I think it's an excellent move by Harbaugh to put him on the recruiting trail. Now hit the jump for some new 2016 and 2018 offers, plus some guys who committed elsewhere and some random bits. Chris Brown at Smart Football has some clips of offensive linemen moving up to the second level (LINK). Note: All rankings are 247 Composite rankings unless otherwise noted. 2015 Team Ranking: #59. Iowa signed one 4-star, nineteen 3-stars, and one 2-star. 2016 Team Ranking: #79. Iowa has two 3-stars committed. Cream of the 2016 Crop: Menomonie (WI) Menomonie pro-style quarterback Nate Stanley is a 247 Composite 3-star, the #52 player at his position, and #962 overall. Jim Harbaugh is in Peru (LINK). There are some very good looking girls if you hit the jump. It's Saturday morning and the weekend has begun. Here are some pictures of some good looking ladies, including a Kate Upton gif. Players are listed in order of remaining eligibility. With 2 open scholarship and 13 seniors scheduled to graduate, the 2016 class should start out aiming for 15 players. - Chris Fox retired due to injury issues. - Dennis Norfleet left the program. - Ondre Pipkins transferred to Texas Tech. - Blake Countess transferred to Auburn. - Blake O'Neill transferred to Michigan from Weber State. - Jake Rudock transferred to Michigan from Iowa. - Jack Miller will not return for a fifth year. 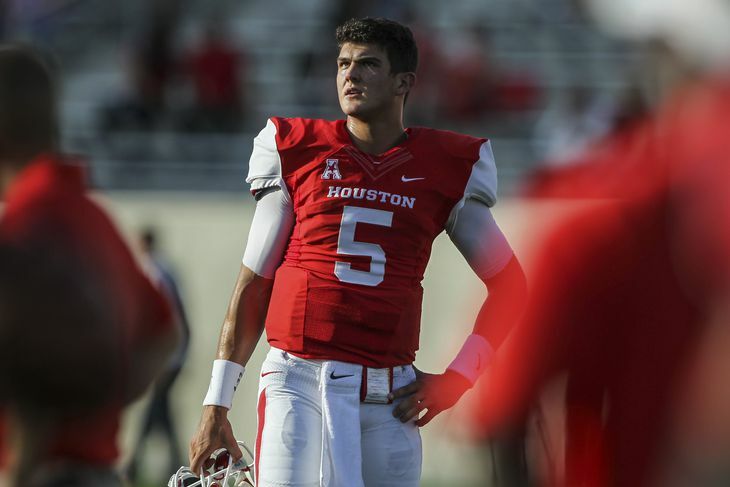 - QB John O'Korn transferred to Michigan from Houston. - Russell Bellomy transferred to University of Texas at San Antonio. - Keith Heitzman will not return for a fifth year. - Justice Hayes transferred to Southern Miss. - Kyle Bosch transferred to West Virginia. - Michael Ferns transferred to West Virginia. Clinton (MS) Clinton running back Cam Akers was offered by Michigan. He's a 6'0", 215 lb. prospect with offers from Alabama, Mississippi State, Ole Miss, and Tennessee, among others. He's a 247 Sports 4-star, the #6 running back, and #62 overall. A high school quarterback, in 2014 he completed 119/200 passes for 1,800 yards, 20 touchdowns, and 5 interceptions; he also ran 166 times for 896 yards and 11 touchdowns. Akers is a sturdily built runner who lacks great breakaway speed, but he has decent acceleration, has good balance, and can break a lot of tackles. Cheshire (CT) Academy wide receiver Tarik Black was offered by Michigan. He's a 6'3", 185 lb. prospect with offers from Alabama, Connecticut, Maryland, and Rutgers, among others. He's a 247 Sports 4-star, the #14 wide receiver, and #97 overall. He claims a 36" vertical. As a sophomore in 2014, he had 57 catches for 926 yards and 12 touchdowns. His film should be taken with a grain of salt since Connecticut lacks much talent in the sport of football, but he makes some very nice acrobatic catches - impressive regardless of competition - and shows some decent speed. Black is high on Michigan and could have the Wolverines #1 on his list early. Dallas (TX) Bishop Dunne cornerback Chevin Calloway was offered by Michigan. He's a 5'10", 180 lb. prospect with offers from Baylor, Notre Dame, Oklahoma, and TCU, among others. He's a 247 Sports 4-star, the #14 cornerback, and #192 overall. He claims a 4.45 forty. Despite just average size, Calloway is good in press man coverage and shows some decent ball skills. West Sayville (NY) Sayville quarterback Jack Coan was offered by Michigan. He's a 6'3", 190 lb. prospect with offers from Maryland, Miami, and Syracuse, among others. As a sophomore in 2014, he completed 195/327 passes for 3,431 yards and 40 touchdowns. Coan throws a nice, catchable ball and has good pocket awareness, but he is not an adept runner and has a delivery that can be very deliberate. He's just beginning the recruiting process and took his first college visit less than a month ago. Hit the jump for several more new offers in the 2017 class. Michigan's ExposureU camp is shaping up to be quite an event, and the expected guest instructors for the quarterback portion include Jameis Winston, Jay Cutler, Colin Kaepernick, Denard Robinson, Elvis Grbac, Blaine Gabbert, and several others (LINK). Rising fifth-year senior cornerback Blake Countess has elected to play his final year of college ball elsewhere. The 5'10", 185 lb. corner was expected to compete for a starting job this fall after having a disappointing 2014 season. Coming out of Olney (MD) Good Counsel, Countess was a Rivals 4-star and the #133 player nationally in the 2011 class. I gave him a TTB Rating of 84 (LINK) and was pleased with his commitment (LINK), which took place shortly before Rich Rodriguez was fired. I thought he would be Michigan's next good corner after Donovan Warren departed in 2009. Countess played immediately as a freshman in 2011 and started six games that year, finishing with 44 tackles, 1.5 tackles for loss, 6 pass breakups, and 1 forced fumble. ESPN and the Big Ten Network included him on their conference all-freshman teams. Entering the 2012 season as a starter, Countess got injured playing special teams in the season opener against Alabama and missed the rest of the year with a torn ACL. He came back with a vengeance in 2013, making First Team All-Big Ten with 46 tackles, 2 tackles for loss, 6 interceptions (1 touchdown), and 4 pass breakups. Big things were expected, but his production fell off (24 tackles, 3 pass breakups) and he saw diminished playing time in 2014. Rumors started to pop up about Countess potentially transferring around the same time Wayne Lyons appeared headed to Michigan. Essentially, the defensive backfield was getting crowded with talented and/or veteran players - Countess, Lyons, junior Jourdan Lewis, sophomore Jabrill Peppers, and senior Jarrod Wilson are all starting-caliber players, and a couple other guys are pushing for playing time. Countess is not a physical corner, and new defensive coordinator D.J. Durkin's preferred style of defense did not seem primed to mesh with Countess's. Even so, Countess would have seen plenty of playing time even if he didn't start. But a 4-star guy in his fifth year - a guy who had 6 picks in one season a couple years ago - should probably be starting somewhere. A player of his caliber has an eye on the NFL, and the NFL doesn't draft many college backups. It's somewhat understandable that Countess would look to transfer to a more amenable situation. Unfortunately, this transfer comes at the expense of Michigan's quality depth. There's likely no question that the two front-runners for the cornerback jobs are Lewis and Lyons, but the only experienced backup is junior Channing Stribling, who has yet to make a significant play despite a fair amount of time on the field. The position is supplemented by redshirt junior Terry Richardson, redshirt sophomore Ross Taylor-Douglas, redshirt sophomore Reon Dawson, and redshirt freshman Brandon Watson, none of whom have registered a single stat. Furthermore, the lone cornerback in the 2015 class is lanky project Keith Washington. There appears to be a serious deficit in cornerback talent when you get younger than Lewis, although Watson has some potential. Five years later, linebacker Desmond Morgan is the only player remaining from the 2011 class, which was the Rodriguez-to-Hoke transition year. Attrition can be expected from classes with that kind of instability, but too many players played early and exhausted their eligibility this past season. It's not hard to avoid drinking and driving. Unless, of course, you are Jim Minick (allegedly). Here's the LINK. It's pretty hard to hold the moral high ground over Graham Glasgow when you make the same stupid mistakes as an administrator. Hit the jump for a couple good looking brunettes and an Asian bikini wearer. Running back/slot receiver/cornerback/kick returner/punt returner Dennis Norfleet has been dismissed from Michigan's football team. Steve Lorenz from 247 Sports reported that he skipped several final exams, which is not a good idea for you prospective college students out there. Rumors had been swirling about Norfleet for the past couple weeks, and this was likely the reason. The story going around is that Jim Harbaugh informed him that he did not see Norfleet playing a significant role in Michigan's future, which caused Norfleet to have a negative reaction. He essentially made an emotional decision and put his academics on the back burner, which sealed the deal for his departure. You may remember that Norfleet was switched to defense in the spring game. Primarily an offensive and special teams player throughout his career, he played cornerback a little at the end of the 2012 season and then this spring. The spring game saw Shane Morris, Amara Darboh, and Jaron Dukes picking on him for several completions, including the only touchdown of the day. Those were unfair matchups since Norfleet was largely inexperienced at the position and going against much larger receivers (Norfleet is 5'7", while Darboh and Dukes are comfortably over 6'0"), but regardless, he had a job to do and didn't get it done. His career offensive output includes 15 carries for 130 yards (8.7 yards/carry) and 21 catches for 157 yards (7.5 yards/catch). He was a little awkward in 2014 as a downfield receiver, excelling more as a screen guy, a change-of-pace guy out of the backfield, etc. Norfleet's biggest contribution came as a kickoff returner, where he was the school's all-time return yardage leader (94 returns for 2,203 yards). He also returned 15 career punts for 90 yards. Norfleet never scored a touchdown in a Michigan uniform, unless you count the game against Maryland when an apparent punt return score was called back due to a penalty. 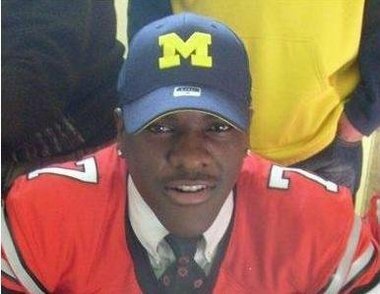 Norfleet was a late addition to the 2012 class, flipping from Cincinnati just before National Signing Day when the Wolverines stepped forward with an offer. In my commitment post (LINK), I thought he would be a solid starter on special teams, and he was. Too small to expect much of a regular role on either side of the ball, I said that I was bothered by the way Norfleet finished plays. It looks like that criticism carries over to classes, too. Despite my criticism, I am a little disappointed that Norfleet will not return to the field for Michigan. He brought a lot of energy with his dancing and antics, and I can't help feeling a little bad for a guy who touches the ball so much and never crosses the goal line. When Norfleet ambled over to the sideline when his touchdown was called back against Maryland, he needed consoling. It seemed like only a matter of time before Norfleet would break a big return, but he was always a half-step too slow or a bit too weak to break the last tackle attempt. Norfleet will likely look to transfer. Since he reportedly has not graduated, he will have to either sit out a year while waiting to become eligible at another FBS school or transfer to a lower division for immediate eligibility. Meanwhile, Michigan will have to find a guy or guys to fill his special teams roles. Jabrill Peppers will probably handle some of those duties, while other candidates include Jourdan Lewis, Freddy Canteen, Amara Darboh, Brian Cole, Blake Countess, and Da'Mario Jones. Akron is showering Michigan 8th and 9th graders with offers, and it suggests a concerning trend in recruiting (LINK). I don't cover much basketball here, because jack of all trades, master of none, right? But I am a big Michigan basketball fan, and I'm excited to see that Gladstone (NJ) Gill St. Bernards shooting guard/small forward Tyus Battle committed to Michigan yesterday. He's a 247 Composite 5-star and #12 overall in the 2016 class. Nobody seemed to be expecting Battle to commit to the Wolverines, at least not yet. Take the following with a grain of salt because I don't - I repeat, don't! - mean these players are the same caliber, but the way Battle moves around the floor, handles the ball, etc. reminds me of a young Kobe Bryant. Michigan is committing approximately one secondary violation per month during the Jim Harbaugh regime (LINK). In site-related news, the tentative launch date of the new website is June 7. Thanks to those of you who have contributed to the efforts. If you would like to donate, please use Paypal (on the left sidebar) or do some shopping through Amazon (LINK). In football-related news, a video popped up on Scout of cornerback Jourdan Lewis working out against various guys at Belleville High School (LINK). One of the guys is former Detroit (MI) Cass Tech quarterback Jayru Campbell, who is headed to prep school after squandering away his college opportunities. Harbor City (CA) Narbonne wide receiver Devaughn Cooper was offered by Michigan. He's a 5'10", 171 lb. prospect with offers from Arizona and Washington, among others. As a junior in 2014, he caught 34 passes for 587 yards and 8 touchdowns. He claims a 4.61 forty. Cooper doesn't have amazing physical skills, but he's a nifty runner after the catch and isn't afraid to catch the ball in traffic. He is a teammate of offensive tackle Alex Akingbulu, who also holds an offer from Michigan. Tampa (FL) Catholic wide receiver Nate Craig-Myers decommitted from Auburn. He's a 6'2", 205 lb. prospect who's a 247 Composite 5-star, the #1 wide receiver, and #23 overall. He never really showed interest in his Michigan offer, and Ohio State has a slim chance, but it looks like Florida State will be the beneficiary of his parting ways with Auburn. Winchester (IN) Community safety Kiante Enis was offered by Michigan. He's a 6'1", 180 lb. prospect with offers from Cincinnati, Indiana, and Louisville, among others. He's a 247 Composite 3-star, the #61 running back, and #792 overall. As a junior in 2014, he ran the ball 299 times for 3,189 yards and 49 touchdowns. He claims a 4.35 forty. Enis has good speed, although film should be taken with a grain of salt when he's running past small-town Indiana kids for a high school that has roughly 500 kids. He's the nephew of former Penn State running back Curtis Enis, who went on to be a first round pick of the Chicago Bears. Michigan appears to be looking at Enis as a safety, although he has some position flexibility to play running back or receiver at the next level. Hit the jump for several more new offers, a few guys who committed elsewhere, and then some random bits. Just like Michigan State did several years ago, I hope Michigan learns to let their actions speak louder than their words (LINK). A great man - one better than Mark Dantonio - once said "Speak softly but carry a big stick." The 100. I barely made it through one episode. It's about a post-apocalyptic world in which 100 teenagers are sent back to Earth, following 97 years of exile due to a nuclear holocaust. If I had to choose between watching an entire season of this show or attempting to have an intelligent conversation with Cardale Jones, I would . . . still watch the show. But it wouldn't be an easy choice. Hit the jump for a few more television series I've been watching, and feel free to leave me some suggestions. Here's an Angelique Chengelis piece on Harbaugh's summer camp plans (LINK). Hit the jump for a few pictures of good looking ladies. Could Valdez Showers be coming home to Michigan to complete his college career? If you're doing some late Mother's Day shopping, please consider doing some shopping on Amazon (LINK). Thanks! It's not really a secret at this point that Michigan is looking for a receiver or two to supplement the current wide receiver corps. The Wolverines do not have a clear option to be the #1 guy for the upcoming season, and at this point, all current players are complementary at best. I mentioned a couple days ago that we would probably be hearing about some potential transfers soon, and Michael Spath from The Wolverine dropped a few receiver names today. I can say that only one of these players was a name I had heard connected to Michigan the other day, and this is the first time I've heard of A.J. Legree (Chris Gallon, Josh Grady, and Valdez Showers were all familiar to me from when they were high schoolers). Chris Gallon - WR - Bowling Green State University: Gallon is a 6'4", 229 lb. wideout who is a cousin of former Wolverine wide receiver Jeremy Gallon. While Jeremy went to Apopka (FL) Apopka, Chris attended Orlando (FL) Dr. Phillips, which produced players like Demetrius Hart (Alabama/Colorado State), Hasean Clinton-Dix (Alabama), Kenny Shaw (Florida State), and Trey Griffey (Arizona). Chris was a Rivals 3-star and the #65 wide receiver in the 2011 class. He redshirted as a freshman and then led the team with 54 catches, 720 yards, and 6 touchdowns in 2012. His last two seasons have been interrupted by injuries (24 catches, 232 yards, 2 touchdowns in 2013), including a total washout of 2014. Gallon is a big target without a lot of speed. On a mostly unrelated note, Gallon was at one time a teammate of former Michigan wide receiver Je'Ron Stokes at BGSU. It's been a long week. Enjoy some good looking ladies, including an Ashley Sky gif! The Ted Wells Report has been filed, and it concludes that Tom Brady probably knew that the Patriots' footballs were being toyed with (LINK). This is not surprising in the least, and it doesn't bother me. The NFL needs to have a standard for their footballs, and a rule needs to be enforced or else the rule shouldn't exist. On the other hand, I just don't really care because almost everybody does it. I don't think it's fair to suspend him for it, so hand him and/or the Patriots a fine and move along. These are the little things I don't care about when guys like Leonard Little, Josh Brent, and Donte Stallworth are allowed to make millions of dollars in your league after they kill people on the roads. I'll be honest - as a coach, I like to throw around a slightly deflated ball in practice. I don't check the pressure, but a fully inflated ball is a little harder to grip and control. But the deflation reaches a point where it becomes counterproductive, and no quarterback wants to throw around a floppy football. Tom Brady plays good football, so if the NFL needs to relax its parameters a little to include some slightly "deflated" balls, then I'm okay with it. Cole Van Lanen - OT - Green Bay (WI) Bay Port: The 6'5", 275 lb. prospect has offers from Illinois, Iowa, Michigan, Michigan State, Minnesota, Nebraska, and Wisconsin, among others. He's a 247 Composite 4-star, the #27 offensive tackle, and #254 overall. All four Crystal Ball predictions have him going to Wisconsin, but he's never been to sunny Ann Arbor before, so things can change in a hurry. Auston Robertson - DE - Fort Wayne (IN) Wayne: Robertson is a 6'5", 230 lb. prospect with offers from Alabama, Indiana, Michigan, Michigan State, Notre Dame, Ohio State, and Penn State, among others. He's a 247 Composite 4-star, the #7 weakside end, and #109 overall. It was uncertain at the time, but he ended up visiting Michigan last Monday with fellow Indiana prospect Austin Mack. Following the visit, Robertson removed Ohio State from his top three and then included Michigan along with Michigan State and Notre Dame. Projection: Defensive tackle. Gary is an exceptional athlete for his position and size. He plays against pretty good competition in high school and still looks dominant. One catch in his situation is that he played defensive end last year, whereas he'll be a tackle in college. He does a good enough job of coming low out of his stance that pad level should not be a major issue; it's only when he tries to use his speed rush around the outside that he loses good body lean. He will also have to learn how to use his hands a little better, but that is something that can get correct pretty quickly. Gary looks like a 3-tech tackle who will be very hard to handle for offensive guards. Reminds me of: Warren Sapp. I don't see a great comparison through Michigan's history - Alan Branch and Gabe Watson were a little too nose tackle-y, and Mike Martin was mostly about quickness, although he was awfully powerful, too. Sapp was both powerful and quick, which also describes Gary. Likelihood of committing to Michigan: 247 Sports' Crystal Ball predictions have Alabama at 52%, Michigan at 31%, and nobody else in double digits. The Wolverines have a couple former Paladins already in the form of redshirt freshmen Jabrill Peppers and Juwann Bushell-Beatty, and they also have the former coach, Chris Partridge, in the role of recruiting coordinator. Gary took a visit to Michigan this spring and thoroughly enjoyed it, but his recruiting process could last until February, and a lot of things can happen between now and then. Michigan is right in the thick of the hunt. SI.com tosses out a way-too-early mock draft for 2016 (LINK). Don't bother looking for any Wolverines, but any self-respect NFL fan loves mock drafts, right? If you would also like to donate to the site redesign drive, please use Paypal (on the left sidebar) or do some shopping on Amazon (LINK). Thanks! Michigan recently had three players drafted in the 2015 NFL Draft - two seniors and a true junior, the latter of which was talented but never really hit his ceiling while in college. Over the past few days, I have seen some gnashing of teeth amongst Michigan fans about whether or not anyone will be drafted in 2016. It's a somewhat valid concern because Michigan does not appear to have many superstars, and nobody leaps out as a likely first or second round pick for next year. However, there are numerous guys who could find their names called next spring. Here is a rundown of the players who could potentially get a phone calling bearing good news during next year's draft. Some of them are young players who might make the choice - wise or not - to leave after their junior or redshirt sophomore seasons. Joe Bolden, LB (Sr.): The 6'3", 232 lb. senior became a part-time starter in 2013 and a full-time starter last year when he finished second on the team with 102 tackles; he also had 4 tackles for loss and 2 sacks. He will be counted on once again to be a leader on the defense, alongside fellow inside linebacker Desmond Morgan. Bolden has never been the most athletic linebacker, but he is known as a smart, high-character guy who usually gets to the right spot. If Jake Ryan is the standard for a 4th rounder, then Bolden might be a late-round selection. Blake Countess (RS Sr.): Countess has had an up-and-down career for the Wolverines. After showing promise as a freshman, he tore his ACL in 2012. Then he had 6 interceptions in 2013, followed by zero - and basically losing his job - as a redshirt junior in 2014, when he did have 24 tackles and 3 pass breakups. If the odd year trend continues, he's poised for a big year here in 2015. The 5'10", 185 lb. Countess will be battling Jourdan Lewis and Wayne Lyons for playing time, but Countess has a shot to get drafted pretty high if he performs like he did two years ago. Graham Glasgow, OL (RS Sr.): The 6'6", 303 lb. Glasgow comes with some off-the-field issues having to do with alcohol, but he has been Michigan's most consistent lineman over the past two seasons. He has the ability to play center, guard, or tackle, although his best fit is probably the guard position. He could probably carry some additional weight if necessary. If Michigan finds success on the ground, much of the credit will probably go to Glasgow, who will probably be the starting center this year now that Jack Miller has departed. Hit the jump for some more seniors and some underclassmen who could be tempted to make a jump to the NFL. Brian from MGoBlog breaks down Jake Rudock's game against Northwestern last year (LINK). Hit the jump for some good looking ladies, and see if you can figure out what the tattoos are on girl #2. Now that winter semester is finished, there should be some news coming soon about transfers to and from Michigan. I have heard rumors about one incoming player (not Jake Rudock, Wayne Lyons, or Blake O'Neill) and four outgoing players, although two of the players leaving the team are for medical reasons. Medical scholarships are frustrating but an understandable part of the game. However, one of the rumored transfers is going to be a little bit of a surprising disappointment. Today's recruiting update includes 2017, 2018, and 2019 prospects. Because of the plethora of offers extended over the past week, I had to make the 2016 update a separate post yesterday (LINK). This may happen more often with the Wolverines offering players at a faster rate than the previous regimes. Fort Lauderdale (FL) American Heritage running back Kyshaun Bryan was offered by Michigan. He's a 5'11", 185 lb. prospect with offers from Florida, Florida State, Miami, and Ohio State, among others. He's a 247 Sports 4-star, the #8 running back, and #68 overall. As a sophomore in 2014, he had 825 yards rushing, averaged 8.4 yards/carry, and scored 7 touchdowns. Bryan is a speedy back with good cutting ability and vision. American Heritage is a football powerhouse, and they sent numerous plays to the FBS in 2015, including defensive back Tarvarus McFadden (Florida State) and quarterback Torrance Gibson (Ohio State). Two of his 2017 classmates also picked up offers from Michigan in Kai-Leon Herbert and Tedarrell Slaton (see below). Holmdel (NJ) St. John Vianney offensive tackle Micah Clark was offered by Michigan. He's a 6'5", 265 lb. prospect with offers from Alabama, Penn State, and Rutgers, among others. He's a 247 Sports 4-star, the #9 offensive tackle, and #69 overall. Clark is a pretty lanky kid right now who could probably be a strongside end or defensive tackle if he worked on his body and technique properly. As things stand, it looks like he will probably be a left tackle in the future. Penn State leads right now, but Alabama and Michigan just came in recently, so he might let things play out for a while before deciding. Cypress (TX) Cy-Fair offensive tackle Austin Deculus was offered by Michigan. He's a 6'5", 275 lb. prospect with offers from Baylor, Illinois, and Texas Tech. He's a 247 Sports 4-star, the #16 offensive tackle, and #98 overall. Deculus is a powerful blocker who has the ability to stay low and blow people off the ball. His classmate, tight end Brock Wright, picked up an offer from Michigan a couple weeks ago. Both attend the alma mater of former Michigan running back Sam McGuffie. 247 Sports looks at some under-the-radar types who have similar games to first round picks who outplayed their recruiting rankings (LINK). Michigan's own Keith Washington makes an appearance. Michigan has now extended 198 offers in the 2016 class, which is the most offers the Wolverines have ever handed out during the Rivals/Scout era. The previous high was 195 in 2011 (LINK). It's not a coincidence that both of those classes are right near transitions. The 2011 group was the combined Rodriguez/Hoke class, while 2016 will be Harbaugh's first full year. Each time a new coach comes in, some previously extended offers are no longer valid; conversely, some new offers have to be given out to make up for lost time. Regardless, it is only the beginning of May, and we are approximately nine months away from National Signing Day. The "record" number of offers will not simply be surpassed - it will be obliterated. Michigan fans have at times criticized Alabama, Ohio State, Tennessee, etc. for littering the countryside with offers, but the Wolverines are entering that category. I have never had a problem with that strategy, because without an offer, only the diehard-iest of diehard recruits will maintain interest (such as Grant Perry, who flipped from Northwestern to Michigan this past winter). An offer is a way to gauge interest. If the player says "thanks" and never does anything more about it, you've extended an offer but can concentrate your efforts on more interested parties. There's no wrong way to eat a Reese's. Brady Hoke generally sent out fewer offers and wanted to develop strong relationships with individual players, and Hoke's recruiting classes were ranked pretty high. I recently read an article about Mike Krzyzewski at Duke (a basketball coach, I know), who tries to only offer one guy at a time until the kid says no or commits elsewhere. Coach K talked about wanting to develop a level of trust with a player from the outset, not telling him he's "their guy" one minute and saying the same thing to another guy at the same position with his next phone call. At the same time, the aforementioned football teams have brought in pretty good recruiting classes, too. Whether you like it or not, Harbaugh is going to be more Urban Meyer and Nick Saban. Hit the jump for a bunch of new 2016 offers, a couple guys who committed elsewhere, and some random bits. Poll results: Which Michigan player(s) will get drafted in the 2015 NFL Draft? Funchess went in the 2nd round (#41 overall) to the Carolina Panthers. Ryan went in the 4th round (#129 overall) to the Green Bay Packers. Clark went in the 2nd round (#63 overall) to the Seattle Seahawks. Gardner signed an undrafted free agent deal as a wide receiver with the New England Patriots. Taylor went undrafted and has not signed with an NFL team. - Defensive end Brennen Beyer signed an undrafted free agent deal with the Baltimore Ravens. - Outside linebacker Josh Furman, who played safety at Michigan before transferring to Oklahoma State for his fifth year, was drafted in the 7th round (#252 overall) by the Denver Broncos. - Cornerback Delonte Hollowell signed an undrafted free agent deal with the Detroit Lions. - Running back Thomas Rawls, who played his senior season at Central Michigan, signed an undrafted free agent deal with the Seattle Seahawks. Here's what the Panthers thought of Funchess (LINK). Hit the jump for some pictures of Ciara, who got some love from Erik Campbell and Jim Harbaugh on Twitter. Brandon Scherff was the first Big Ten player taken. He went #5 to the Washington Redskins. For those of you interested in how the Big Ten is doing in the NFL Draft, here's a rundown of all the Big Ten prospects taken. Ohio State led the conference with five draft selections, while Michigan State and Minnesota had four each. Probably like many of you, I occasionally have a hankering for some Michigan NFL Draft history. Below you will find (as far as I'm aware) every pro draft pick in the history of Michigan's football program going all the way back to 1937. The plan is to update this list after this year's draft and keep updating it when appropriate. Michigan's only two #1 overall NFL Draft picks are Jake Long in 2008 and Tom Harmon in 1941. Hit the jump for the remainder of Michigan's historical draft picks. Here's the link (LINK). I don't talk much about apparel here, but Michigan is apparently trying to move away from Adidas. It looks like it will come down to Nike or Under Armour for the future of the Wolverines. I am intrigued by Under Armour because I like some of their team designs, as well as some of their products. But you can't really go wrong with Nike. Either way, I have not been impressed with Adidas and would like to see them go away. Hit the jump for three pictures of women in bikinis.